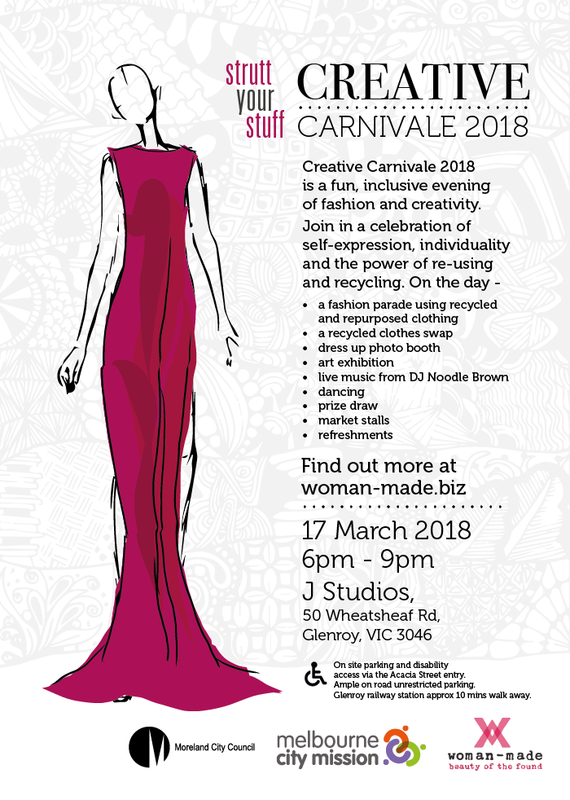 Strutt Your Stuff Creative Carnivale 2018 was a fun, inclusive evening of fashion and creativity held in Glenroy on 17 March 2018. Organised by Angela Pollock and Sheena Mathieson, the event celebrated self-expression, individuality and the power of re-using and recycling. It was a truly inclusive event. Created by the community, for the community, Strutt Your Stuff 2018 demonstrates what can be achieved when we all work together. Thanks to all those who volunteered their time and energy and to supporting partners. To see more about this great event have a look at the great film produced by Rachel Wood. J Studios, 50 Wheatsheaf Rd, Glenroy. A family friendly free event. Creative Carnivale 2018, presented by Strutt Your Stuff, is an opportunity to enjoy an evening out and connect with other people. There’s something for everyone, with a range of activities on offer for all interests and abilities. Taking place in Glenroy in the City of Moreland. Great fun activities and light refreshments. Creative Carnivale is an alcohol-free and halal event. Plus, you may be interested in? We’d love to hear from you! Please contact Angela on 0431 451 768 or email Sheena. Copyright © 2019 Woman-Made. Powered by WordPress. Theme: Spacious by ThemeGrill.